As it’s only a matter of days until Fallout 76 comes out – countdown to November 14 – Bethesda has treated us to a live-action trailer for the game. It opens with a giant sloth ambling slowly across the screen before we see a woman in a blue dress and white pinny laughing with glee in a green meadow as she spins on the spot firing sub-machine guns. What is this: Alice in Wonderland directed by the National Rifle Association? Within the minute duration of the trailer a range of biomes and group activities are shown. There’s a swamp with a large warty green frog in the foreground and a plane wreck to explore in the background. Then we see a ramshackle fort with a campfire at the centre, people gathered round playing guitar, one of them wearing a party hat. 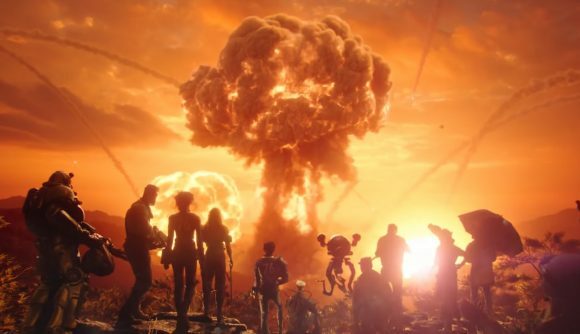 The trailer ends with a nuke going off, sending a tremendous orange across the wasteland, as a ragtag bunch of survivors halt with awe, smiling to each other as if it were a job well done. The live-action trailer was first shown during the Saints vs. Vikings NFL game earlier today, as the Fallout Twitter account tells us. It’s now been released on the internet so everyone can watch it – including you, so have at it below. Entertained? If so, bear in mind that the Fallout 76 release date is creeping up on us now. So save those pennies if you want to jump in on release day. Bring your friends, too – the post-apocalypse is better when you have some tasty people around… just in case you run out of food, you know?